Goodman Games has come out with several dice tubes, which are named after iconic Dungeon Crawl Classics and Mutant Crawl Classics characters painted by the talented Doug Kovacs. Each of these dice sets comes with a little "extra" printed on the reverse of the label. Dice sets include: D3, D4, D5, D6, D7, D8, D10, D%10, D12, D14, D16, D20, D24, and D30. Hugh's Weird Dice: This set contains the very dice that Hugh the Barbarian used to defeat a host of terrible adversaries and acquire his legendary magical bell-bottoms. Using these dice in your game is guaranteed to bring good fortune, especially if you rub them on a moustache prior to each session. Dice are white with red numerals. DCC extra is the "blue gowl". Shanna's Weird Dice: This set contains the very dice that Shanna Dahaka used to invoke Azi Dahaka and enchant her magical afro. Dice are black with gold numerals. DCC extra is the "violet gowl". Chuck's Lucky Dice: These are the very dice used by Chuck Plimpton in his tavern games. He is reputed to be quite lucky, and if you doubt that, you should know that Chuck made it back from the land of the dead! He had a set of these dice on his person at the time, and while the dice probably had nothing to do with it, can you afford to take that chance? Dice are green with gold numerals. DCC extra is "Chuck's Little Table of Big Trouble". Alamanter's Extraspacial Angularities: These dice were created by Alamanter the Violet during his studies in the city of Ciz. Each die draws upon the power of extra-dimensional space to randomly determine numbers. It is said that under the right conditions they can roll numbers that don’t even exist! Dice are violet with silver numerals. DCC extra is "The Brined Finger of Alamanter". Sezrekan's Sanguivorous Solids: These are the most dangerous dice ever created. The evil Sezrekan trapped in each the soul of a creature from the depths of the infernal realms, and these creatures crave blood! Whether it be your blood or the blood of your enemies, they care not! Beware fumbling with these dice! These dice are many-colored. 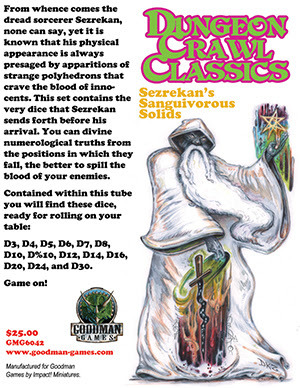 DCC extra is "Sezrekan's Sanguivorous Sliver". Dice of Lost Lemuria: The Dice of Lost Lemuria have an icy color to them, matching the elven legend of the frozen lost continent. Dice are blue with white numerals. DCC extra is the "Ice Stones of Mu". Ming's Infernal Bones: Ming’s Infernal Bones bear a resemblance to the fiery baubles that follow his legend, thanks to his love of flames. Dice are red with white numerals. DCC extra is "The Devil's Bauble". Grakk's Rad Dice: Seasoned veteran of many a melee, Grakk knows how to bring the maximum pain to any hand-to-hand battle. This set of radioactive green dice has been blessed by the War AIs themselves to ensure maximum damage when rolled in any combat on Terra A.D. Dice are green with black numerals. MCC extra is "Grakk's Artifacts". Kilra's Glow Dice: This set of dice glow-in-the-dark! Savage raider of the wastelands, Kilra knows when to push her luck and when to burn it. This set of glow-in-the-dark dice has already been exposed to the radiation and luck- enhancing quantum fields of Terra A.D. Dice are that off-white/green color of glow-in-the-dark plastic with black numerals. 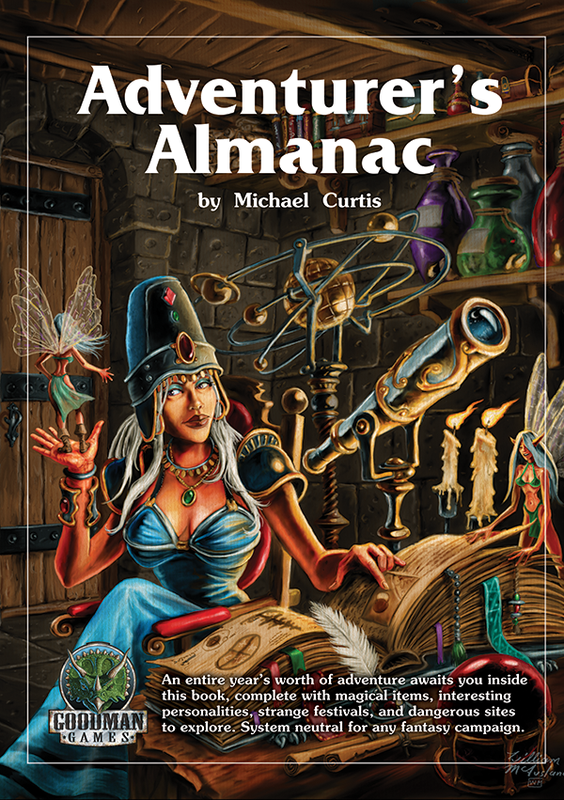 MCC extra is "Kilra's Artifacts"
Available Goodman Games dice sets can be obtained here. The Dice of Lost Lemuria and Ming's Infernal Bones were only available at the Goodman Games booth at North Texas RPG Con and Origins in 2017. MCC-based dice sets were announced in 2017. This listing was put together with the help of the Dungeon Crawl Classics community, and especially Impact Miniatures. Thank you for all the help! DCC #92.5 Dread on Demon Crown Hill is a level 2 adventure by Michael Curtis. It was illustrated by Doug Kovacs (who also did the cartography) and Stefan Poag. The publisher is Goodman Games. This is a relatively new adventure, and one that could easily be fit into a convention or road crew game slot, so I am going to avoid spoilers as much as I can. Like many Appendix N stories, this adventure thrusts the PCs neatly into the story of other beings, but it is the PCs' actions that resolve the story in one way or another. This is such a constant theme of Appendix N literature - occurring in stories by Fritz Leiber, Robert E. Howard, A. Merritt, and others - that it is difficult to pinpoint influences here. 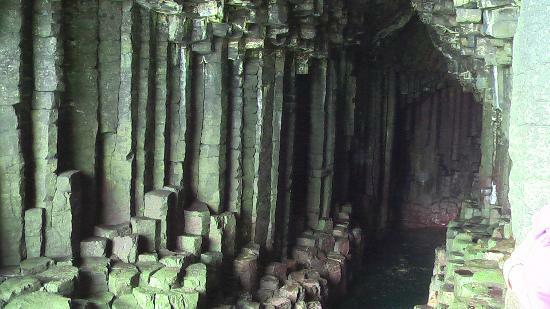 The area that the adventure takes place in is reminiscent of the Giant's Causeway in Northern Ireland (which the author calls out), or Fingal's Cave in Scotland. This offers a cool backdrop the the adventure's action. The adventure itself is fairly linear, with only one possible side digression. That's great for convention play, but the prospective judge of a home campaign may wish to increase the options somewhat. Likewise, there are creatures in this adventure that should have a marked footprint on the land around Demon Crown Hill; the prospective judge will probably wish to consider this for campaign play. Area 1-8 is singularly wonderful, and worth the price of admission by itself. Long ago, Frygorix of the Thousand Lies, a foul demon, ruled with fear from atop a lonely tor, spreading death and plague across the land. Two brave siblings, one bearing an enchanted shield of great power, challenged the demon, vowing to slay it and free the land. In their climactic battle, black towers of six-sided stone arose from the hilltop, an eerie outcropping called the Demon Crown by some. Stories hold that the shield lied untouched within the Demon Crown, but who knows what else might dwell within those weird, dark pillages of unearthly rock? 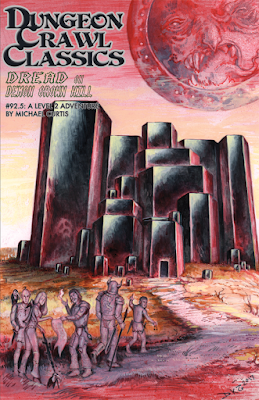 Right now, Dread on Demon Crown Hill is only available through retailers. I picked mine up at 401 Games in Toronto. Curse of Mistwood is a level 4-6 adventure, written by Daniel J. Bishop and David W. Fisher. Illustrations are by David W. Fisher. Cartography is by David W. Fisher, Brian Van Hunsel and Del Teigeler. The publisher is Shinobi27 Games. Disclosure: I am one of the writers, and have an editing credit as well. 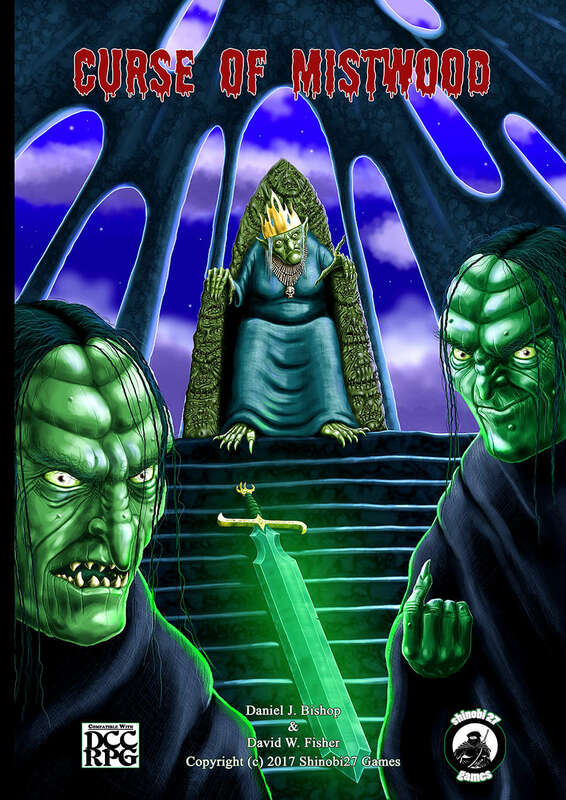 Curse of Mistwood is the sequel to The Trolls of Mistwood. It is a massive adventure, beginning in the swamp-side town of Mistwood, and crossing over to Barg'herzarag, the Hagworld. Mistwood has changed, and there are dark portents that the end of the world may itself be nigh. This was an enormously fun adventure to work on. Hags have been a staple of gaming since the 1st Edition AD&D Monster Manual, at least. Over the years, "gaming" hags have made departures from, and callbacks to, "folklore" hags. This offered a chance to create a mythology of hags which enables them to be recognizable to longterm gamers, strikes the itch of folklore, and incorporates Appendix N.
As an example, we provided rules for being hag-ridden in the "real" world of Mistwood, which can have a rather nasty side effect when characters transit to the Hagworld. We also supply a sort of ecology of hags, which can be used to personalize randomly encountered hags in this (or other) adventures. In fact, I would go so far as to say that in Curse of Mistwood an attempt was made to simultaneously define hags for Dungeon Crawl Classics while following the "Make Monsters Mysterious" advice of the core rulebook. Others will have to determine how successful (or not) we were in that task. Events in the adventure take place five years after those of The Trolls of Mistwood, and the town has changed...from the events of the earlier adventure, from the passage of time, and from what is now spurring the PCs toward a crisis. Mistwood is described well enough in this adventure, and in Trolls, that a judge could easily use it as part of the backdrop to a campaign, starting right from the 0-level funnel until the characters retire or die. Barg'herzarag is detailed so that the aspiring judge could set his own adventures in the Hagworld as well as merely frighten his players with this adventure. Of course, the Hagworld is an unpleasant place, with complete details on how magic is different and some rather unpleasant encounters to be had. Dungeon Crawl Classics completists will note some crossover with The Arwich Grinder and Creeping Beauties of the Wood. Carproaches made an appearance in The Gong Farmer's Almanac. The demo-grues, of course, take their inspiration from Jack Vance...indeed, one hopes that a sense of Jack Vance colors the whole of Barg'herzarag, although his is not the only Appendix N inspiration. Travel through the Hagworld is a means to an end, though, and that end is Wartaren, the Living Castle. As one of the authors, I hope you find the castle suitably horrific. There are a number of ways that the PCs can deal with Wartaren and its occupants. 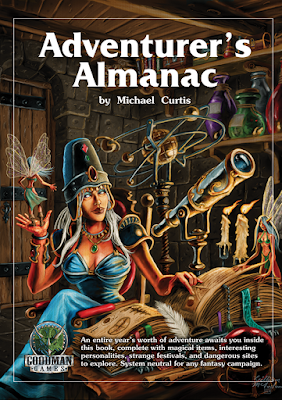 The adventure describes the factions and politics of the Hagworld, so that the PCs can gain allies or take sides. Wartaren is large enough, and detailed enough, for two or three sessions of play. As the commercial goes: But wait! There's more! Curse of Mistwood has five appendixes, detailing Foes and Allies, Demons of Barg'Herzarag, Patrons of Mistwood, the Scrying spell, and the magic sword, Clawreaver. How useful some of these appendixes are to you wil depend upon what other materials you own. The patrons described herein can all be found in the Extended, Otherworldly Edition of Angels, Daemons, and Beings Between, for instance, while the Scrying spell is from The Revelation of Mulmo. A bunch of demons that visit Barg'herzarag, and might be found as guests in Wartaren? Those could be used anywhere. In fact, the cunning judge could take a page from The Fallible Fiend and have one of these demons encountered in a non-combative capacity early on in the PCs' careers. The PCs might even discover a strange allegiance forming! Curse of Mistwood is the second adventure in the Mistwood Series. It can be played as a continuation of The Trolls of Mistwood or as a standalone adventure. With 70 pages of adventure and over 20 pages of patrons, spells and magic items, Curse of Mistwood has enough material to be its own campaign setting. A dark power has stirred in Mistwood. An evil so great that not only is the quiet waterside village at risk but perhaps the world itself. Once more adventurers must heed the call to arms, risking everything to thwart the plans of a much greater foe. Will the adventurers have the courage to seek the source of Mistwood's woes, or will they be consumed trying?